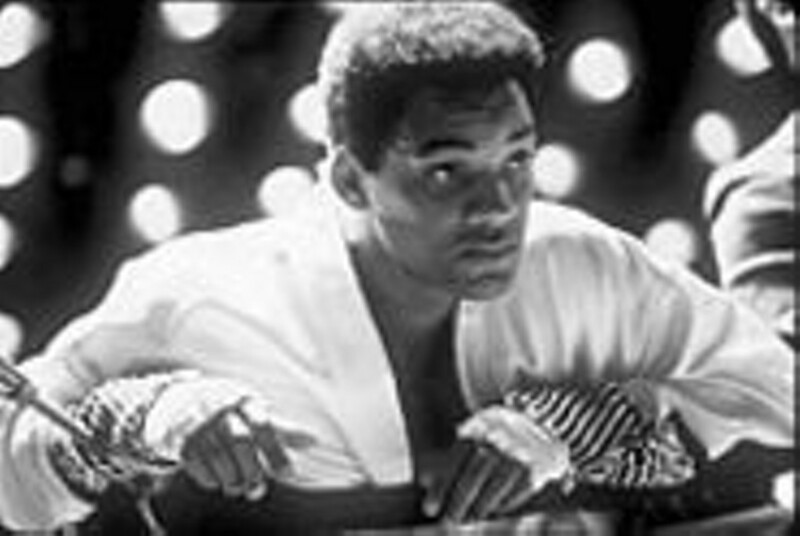 The greatest ... imitation: Will Smith makes for a credible Cassius Clay in a film that spins a familiar tale. Now showing at multiple locations. The most daunting thing for an actor is to portray a god, and when that god comes equipped with a tangle of myths and the quickest left jab in history, the actor's job can soon verge into guesswork. To Will Smith's credit, he has managed to get, at least partway, inside Muhammad Ali's skin. He put on 35 pounds of smooth muscle to play the title role in Michael Mann's Ali. He did high-altitude roadwork in Aspen and took boxing lessons from trainer Angelo Dundee; he even observed the old fight-game superstition that dictates months of sexual abstinence before a big bout. Like a novice painter studying the old masters, Smith also absorbed every scrap of Ali tape and film to better mimic the champ's lightning moves, glittering vanities and streams of verbal alchemy. This worked out. To hear the young, beefed-up Smith reproduce the Louisville Lip's cunning purr -- "I am a baaad man!" -- and to watch him dance over the canvas, en route to stunning the fearsome Sonny Liston, is to be once more immersed in the Ali magic. After looking bad in two recent bouts-- Wild Wild West and The Legend of Bagger Vance -- Smith has found his best form. This film gives the Fresh Prince new dramatic weight and stature. If not before, he's a real actor now. Unfortunately, he doesn't get a lot of help from his corner, which is to say the horde of writers who pieced together the Ali script. Since 1994, the story has passed from Gregory Allen Howard (Remember the Titans) to Stephen J. Rivele and Christopher Wilkinson (who wrote Nixon with Oliver Stone), then to Eric Roth and Mann (who co-wrote The Insider). Not surprisingly, this screenplay-by-committee lacks verve and focus: It gives us the thrill of Ali's punch but shorts us on the art of his life. Instead, we get the usual tour, 1964-74: Brash young Cassius Clay from Louisville wins title, hooks up with Nation of Islam, sacrifices prime years of career for political beliefs, then stages greatest boxing comeback of them all by working his daring rope-a-dope ploy against mighty George Foreman. We also get glimpses of his women and fleeting hints of what he meant to the world: the adulation of African kids in Kinshasa, the love he evinced from American blacks, his soaring charisma, the way he took an entire sport on his back, maybe even an entire people. But not even Smith's best efforts get to the bottom of Ali's hungers, his restlessness or, most vital, his burning urge for self-determination. For a clearer sense of all that, watch the 1996 documentary When We Were Kings; read David Remnick's exemplary Ali biography, King of the World; or dig up a copy of Norman Mailer's The Fight, with its visions of the Ali ego communing with the spirits of Africa. For his part, director Mann has always thrived in the company of tough guys -- witness the small-time hoods of Thief and the street-weary cops of Crime Story and Heat -- so he's right at home in the rough-and-tumble of heavyweight boxing. The brilliant fight scenes in Ali, inhabited by real-life boxers, are jittery, dangerous and flecked with blood. This is not the cartoon heroism of Rocky but the rock-hard violence of Raging Bull. Michael Bentt's Liston, James Toney's bullish Joe Frazier and, best of all, Charles Shufford's glowering Foreman are convincing menaces to our hero, not least because Mann instructed every one of them to whale away on camera. That Smith didn't wind up in a coma is a minor miracle. As always, Mann gives us telling details -- the way a trainer tapes a hand, Foreman's sledgehammer blows to the heavy bag, the dispossessed Ali glumly watching the 1968 Olympics on TV in a gas station -- and the confidants and hangers-on are uniformly vivid. As Drew "Bundini" Brown, Ali's resident witch doctor, nag and inspiration, Jamie Foxx provides the right touch of street sass, and Jon Voight's scarily authentic, heavy-lidded Howard Cosell reminds us, in no uncertain terms, of his complex role as Ali's defender and media foil. The fighter's wives -- played by Jada Pinkett Smith, Nona Gaye and Michael Michele -- are sketchy at best (Mann's strength has never been female characters), but Ron Silver (as gritty Angelo Dundee) and Mario Van Peebles (Malcolm X) create gems in limited screen time. Ali bristles with fight-night thrills -- the "Rumble in the Jungle" finale against Foreman is, well, a knockout, if a bit long in coming -- and the film's got the endorsement of The Champ himself, who has understandably disowned 1977's dreary swing-and-a-miss at his life, The Greatest. But Muhammad Ali's spirit, his life force, is not quite present here, despite Smith's astonishing mimicry and Mann's considerable perspiration. In the end, the greatest athlete of the 20th century and one of its most magnetic personages remains a mystery, as all gods must.